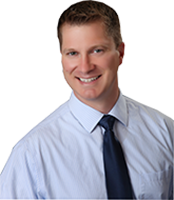 Dr. Nick joined Koenigsknecht Dentistry in 2005 after graduating from the University of Michigan School of Dentistry. He is a Past President of the St. Johns Rotary Club and is also a member of the Knights of Columbus. He served on the St. Johns Public Schools Board of Education for eight years. Dr. Nick is a 1997 graduate of St. Johns Public Schools. He lives with his wife, Erin and children Roman and Faye in St. Johns. 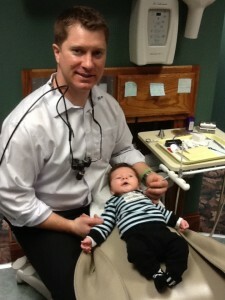 Dr. Nick has completed coursework at Spear Education in Scottsdale, AZ. This training from some of the world’s best restorative and aesthetic dentists focused on cosmetic dentistry and creating veneers and tooth-colored crowns. Another advanced training included treating TMJ/TMD disorders using more specialized bite guards for migraine patients. 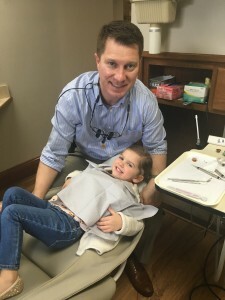 He has particular expertise in crowns, implants, tooth colored bonding, root canals, extractions, bridges and treatment for TMJ and migraines associated with teeth grinding. Dr. Nick sees patients Tuesday-Friday. Dr. Nick and his daughter Faye at her first dental cleaning!